Home | Serigraphs and Giclee Fine Art | P.S. Gordon | P.S. Gordon Limited Edition Serigraph on Paper: " Flora, Flora, Where's the Fauna? (Starling Under Glass) "
P.S. Gordon Limited Edition Serigraph on Paper: " Flora, Flora, Where's the Fauna? 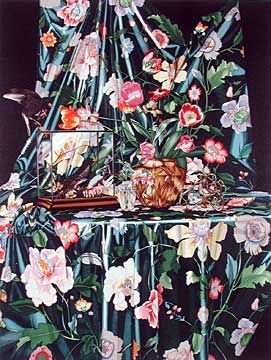 (Starling Under Glass) "
Image Size: 40.5" x 30.5"
Home | Fine Art Prints & Limited Editions | Gallery Direct Art is your Authorized Chalk & Vermilion Dealer | P.S. Gordon | P.S. Gordon Limited Edition Serigraph on Paper: " Flora, Flora, Where's the Fauna? (Starling Under Glass) "